Siddhanta Kaumudi is a celebrated Sanskrit commentary by Bhattoji Dikshita (early 17th century) on the Ashtadhydyi and is believed to be more popular than Panini’s work. It re-arranges the sutras of Panini under appropriate heads and offers exposition that is orderly and easy to follow. The sutras are arranged in two parts – the first part deals with the rules of interpretation, sandhis, declensions, formation of feminines, case endings, compounds, secondary derivations and the second part with conjugation, primary suffixes, Vedic grammar and accents. English commentary of Siddhanta Kaumudi by Saradaranjan Ray & Kumudranjan Ray is highly useful to students of Sanskrit grammar who are not capable of studying the Ashtadhyayi or Siddhanta Kaumudi with the help of Sanskrit commentaries. Nice Job.Would be beneficial to all. This may sound like asking too much but could yo also post Madya Siddanta Kaumudi with English/Hindi Commentaries and Bhatti Kavya with/without commentaries. Sorry. I could not find anywhere on the net copies of Madhya Siddhanta Kaumudi with English translation. If someone has, please write to me. I also didn’t find Madhya Siddanta but I found at least three different editions of Bhatti Kavya. But I am not familiar how to download pdf from that site. Seems quite confusing. I hope you will download and upload here with some great information. Madhya Siddhanta Kaumudi is not available with Eng./Hindi commentaries in public domain. But if you want it with sanskrit commentary, try DLI with barcode: 99999990044381. Thank you Low Resolution but readable. These were not scanned by me. Nor do I have the hard copies of these books. In fact these are from the Digital Library of Archaeological Survey of India. Let us thank the concerned authorities at ASI for providing at least these. I found nearly 15 different editions at DLI. I will mail you the list of different editions of Bhattikavyam available at DLI. It is difficult to know which is best for posting in this blog. Could you suggest which edition of Bhattikavyam will be ideal for posting on this blog? A long standing necessity is fulfilled by you. Now try Eng. pdf of Panini Ashtadhyayi. You have been doing a yeoman’s service to the cause of Sanskrit learning. I had seen Prof.Saradaranjan Ray’s Siddhantakaumudi(first volume and Taddhita volume only) at our library twentyfive years ago. I had copied the whole first volume manually in an exercise book. I wished to have complete set of the work.But I could not have the other volumes anywhere.Now, it is because of your enthusiasm of spreading Sanskrit knowledge,all volumes are available to the Sanskrit circle.The photocopy is very gorgeous. Glad to hear from you after a long time. Thanks. This book of sanscrit grammer is very useful for the student of panini sutra. and they can make their study with this book with proper guide. THANKS FOR THE LIBRARY AND THE PEOPLE BEHIND THIS WORK. The Madhyasiddhanta Kaumudi of Varadaraja, edited and annotated along with the Sanskrit scholium, ‘Prabhakari’, and a Hindi translation, by Acarya Visvanatha Sastri Prabhakara, has been published by Motilal Banarsidass. The paperback edition costs Rs. 145. Thank you very much for posting the whole of Saradaranjan Ray’s English exposition of the Siddhantakaumudi. It will be extremely kind of you to post the Srisa Chandra Vasu translation of the Siddhantakaumudi, if possible. A good Sanskrit exposition of the Bhattikavyam in two volumes is the Bhattikavyaprakasah of Swami Prajnanananda Saraswati (a.k.a. Prajnanananda Bhiksu), published by Chowkhamba of Varanasi. Thanks for posting the details here. I will try to post Srisa Chandra Vasu’s Siddhanta Kaumudi in a day or two. Thank you very much. I look forward to reading the S. C. Vasu translation of the Siddhantakaumudi. i am a phd student in International Islamic University Islamabad pakistan. my research topic is the comparative study of the book of Panini Ashtadhyayi and the book of Sibawaihi al-Kitab.i couldnot find the latest translations of Ashtadhyayi like Rama Nath Sharma’s Translation and S.D.Joshi . any friend who provide me the soft copy of these two valuable translations i willbe grateful . i couldnot find the hard copies of them in Pakistan. 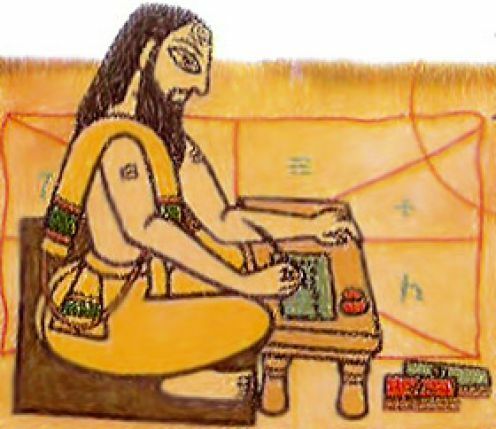 The goal of this blog is to make available the Sanskrit ebooks that are in public domain. Please do not request for copyrighted books. I have sent you a mail with some helpful hints. i got the link and tried to download but still couldnt succeeded in downlaoding the file. Please “right-click” on the links and save the files. I am looking for some books on Sidhanta Kaumudi, which have detailed commentary/explanations, preferably with examples. I am ok with either Hindi or English language books. I am looking for books in print (not ebooks), so that I can buy these. Can somebody recommend this list of books to me? You could try posting this as a query in “Samskrita Google Group” and you are sure to get very good suggestions from the Sanskrit scholars of that group. you have done such honorable works,that there are no words to express thanks or gratitude.You rather we should open such forum where all seeker of ancient Aryan /Hindu(Misnomer) religion may come and drink nectar of spiritualism ,religion,wisdom in sanskrit language.Let us safeguard and spread ancient Aryan Religion and knowledge contained in Sanskrit.The zeal and sacrifice of Maharishi Dayanand Saraswati of Arya Samaj is required. Siddhanta Kaumudi volumes are in pdf format. If you have a pdf reader, you must be able to open and read them. I haven’t used MAC. Taranatha Tarkavacaspati Bhattacarya, author of the Vacaspatyam dictionary, wrote a Sanskrit scholium called Sarala on the Siddhantakaumudi of Bhattoji Diksita. Has anyone a digital copy of the full text? I have not been able to download it from http://www.new.dli.gov.in/ due to poor internet connection. I am grateful for the publications made in this site. The Siddhantha Kaumudi sets are immensely useful to me. The interesting books available here kindle further interest in learning The Great Language, “Sanskrit”. The Volumes 5 and 6 are not getting downloaded! This may please be looked into at the earliest. Dr Rao, I checked the links of volumes 5 and 6. Both are working. Still, if you are not able to download from those links, all volumes are also available at archive.org. Giving below links of volumes 5 and 6. The links are not working. Kindly check and correct. Your work is really great. It is really inspiring that you provide such great books at free of cost.I never thought that such a platform will be available for downloading such books. Than you sir.